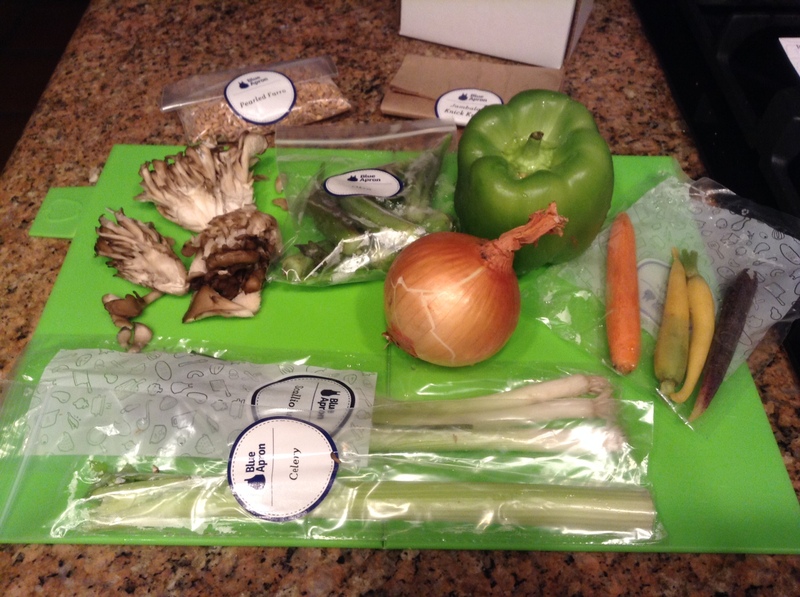 My sister recently sent me a subscription to Blue Apron and a box arrived right to my door. I was intrigued. The company sends you all the fresh ingredients to prepare three delicious meals for your family during the week, along with the recipe (including photos) to help you prepare it. It was Mardi Gras this week so the meals all seamed to have a creole/cajun theme. I decided to start with the Farro Jambalaya. Full of fragrant vegetables, this hearty meal was a hit with my family. I have included the recipe here so I can make it again. Yummy! Step 1 (Preparation): Wash and dry the fresh produce. Cut the mushrooms into large pieces. Cut off and discard the okra stems; cut the okra into ½-inch rounds. Slice the carrots into ½-inch rounds. Cut off and discard the root ends of the scallions; thinly slice the scallions on an angle, separating the white bottoms and green tops. Remove and discard the stem, ribs and seeds of the bell pepper; medium dice the bell pepper. Medium dice the celery. Peel and medium dice the onion. Rinse and drain the beans. Step 2 (Cook veggies and spices): In a medium pot, heat 2 teaspoons of olive oil on medium-high until hot. Add the carrots, white bottoms of the scallions, bell pepper, celery, onion and as much of the spice blend as you’d like (I use it all), depending on how spicy you’d like the dish to be; season with salt and pepper. Cook, stirring occasionally, 3 to 4 minutes, or until the vegetables are slightly softened. Step 3 (Add faro, beans and tomatoes): Add the farro to the pot of aromatics; cook, stirring frequently, 30 seconds to 1 minute, or until toasted and fragrant. 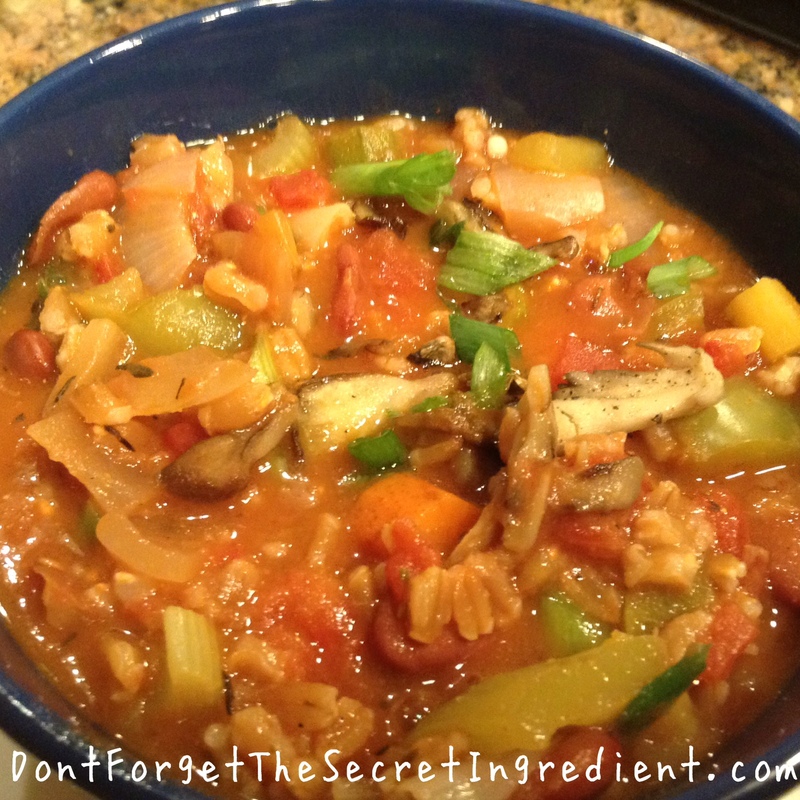 Add the diced tomatoes, beans and 4 cups of water; season with salt and pepper. Heat to boiling on high. Once boiling, reduce the heat to medium-high and simmer, stirring occasionally, 16 to 18 minutes, or until the farro is tender. Step 4 (Crisp the mushrooms): While the farro and beans cook, in a medium pan (nonstick, if you have one), heat 2 teaspoons of olive oil on medium-high until hot. Add the mushrooms. Cook, stirring occasionally, 4 to 5 minutes, or until browned and crispy. Transfer to a paper towel-lined plate; season with salt and pepper to taste. Set aside in a warm place. Step 5 (Finish the jambalaya): Add the okra to the pot of farro, beans and vegetables. Cook, stirring occasionally, 5 to 7 minutes, or until thickened and slightly reduced. Remove from heat and season with salt and pepper to taste. Step 6 (Plate your dish): Divide the jambalaya between 3-4 bowls. Top with the crispy mushrooms and green tops of the scallions. Serve with as much of the Tabasco hot sauce as you’d like, depending on how spicy you’d like the dish to be. Enjoy! That looks so warm and delicious! Can’t wait to try!